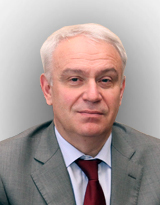 Sergey A. Boytsov, MD, PhD, Professor, Director of the State Research Center for Preventive Medicine under the Health Ministry (HM) of the Russian Federation (RF), Honored Doctor of the RF. In 1980 he graduated with honors from S.M. Kirov Military Medical Academy (S.M. Kirov MMA) in Leningrad and in 1980-1984 served in the Northern Fleet as a Chief of the medical service of a nuclear submarine. In 1984 he entered a PhD programme at the Department of Naval and Hospital Therapy of S.M. Kirov MMA, which he successfully completed in 1987. In 1987-2002 he continued to work at the Department of Naval and Hospital Therapy (in 1991 it was renamed the Department of Naval, Hospital and General Therapy) of S.M. Kirov MMA. In 2002, in a rank of the Colonel of the Medical Service he completed service in the Armed Forces of RF and continued his career as the Chief Physician of the National Medical Center of HM of the RF (Moscow), renamed in 2003 in the N.I. Pirogov National Medical and Surgical Center (NMSC) of HM of the RF. In 2003-2006 he worked as a Director of the Central Clinical Diagnostic Complex and was a Head of the Department of Internal Medicine of N.I. Pirogov NMSC. In 2006-2011 he worked as the Deputy for Science - the First Deputy Director General of the Russian Cardiology Research and Production Complex of HM of the RF. Since March 2011 he is working as a Director of the State Research Center for Preventive Medicine, HM of the RF. Since 2014 he is a Head of the Department of Outpatient Therapy of the Medical Faculty of Moscow State University of Medicine and Dentistry named after A.I. Evdokimov. Since January 2003 Prof. S.A. Boytsov acting as a Chief Physician of the Central Federal District, and since May 2011 as a Chief Specialist in preventive medicine of HM of the RF. Prof. S. Boytsov was awarded the Order of the "Badge of Honor", Gold Medal and Diploma of the V-th Congress of Heart Association of CIS "For Contribution to the Development of Cardiology", Diplomas of the HM of the RF (2010, 2012, and 2015). European Society of Cardiology, member of the working group "Coronary Pathophysiology and Microcirculation"
Chief Editor of the Journal "Rational Pharmacotherapy in Cardiology"
Member of the Editorial Board of the following journals “Therapeutic archive”, “Russian Heart Journal”, “Russian Heart Failure Journal”, “Arterial Hypertension”, “New St. Petersburg Medical Bulletin”, “Cardiovascular Therapy and Prevention”, “Cardiology Bulletin”, “Medical Board”, “Journal of Cardiovascular Medicine” (journal under the auspices of the European Society of Cardiology). Total number of scientific publications: more than 400 scientific articles, 2 monographs, 7 guidelines, 6 patents.